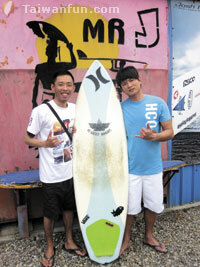 Local surfer Mitchell Hsu Ming-Chien has ridden the waves of Yilan and Kenting, two of Taiwan's better-known beaches. But on this warm Sunday afternoon, Da-an was calling. Only an hour's car ride away from Taichung, Da-an attracts surfers such as Mitchell with its laid-back, friendly charm. "It's like a big family here," says the 28-year-old Taichung student. "Everybody is really relaxed." After a morning of surfing waist-high waves on a longboard, Mitchell and his girlfriend caught up with friends on a picnic table outside Mr. J Surfwork, the small town's only surf shop. "Summer is a good time to come," says Jason Lin, 32, who opened up the shop five years ago, adding that the small waves were also perfect for first-timers. Jason began surfing 10 years ago at Honeymoon Bay in Yilan and liked it so much that he bought a surfboard. From there his passion has taken him to as far away as Bali and Hawaii. And, while Da-an is not Waikiki, where the sport gained global fame, it does offer local surfers a friendly and convenient place to ride some waves free of crowds. Jason notes that most of the surfers are from Taichung, but added that a fair number travel from Nantou and Chiayi. 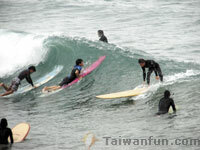 Occasionally, wave-riders will also make the trip down from Taipei. While the water is often silty, Jason emphasizes how safe it is to surf Da-an. Instead of hazardous coral, there's a sandy bottom that doesn't drop off too fast, he points out. Also, there's plenty of space so you won't bump into others. From now and through the summer months, Mr. J Surfwork is open seven days a week. Board rentals are NT$500 a day and if you wish to stay in one of the rooms the cost is NT$400 per night. The store also offers wetsuits, rash guards, and lessons for beginner surfers. In the summertime, three-meter longboards are the norm, but in winter more maneuverable shortboards half that size are used. While waves are smaller in the summer--usually in the one-meter range--winter waves can easily reach above a surfer's head. And when do you go if you're looking for some truly big waves? "Typhoon," said Jason, pointing to the three-meter-high ceiling. Mr. J Surfwork is open daily from 9 a.m. to 7 p.m. For more information visit www.jasonsurfwork.com or call the shop at 0928-337-760.